A prayer each day keeps the adversary away. How regular is your prayer life? My Newly Adopted Odd-Eye Kitty.. When I was feeding our neighbor’s cat, Catcat, this white kitten just came out from the bushes stretching and seemed to just awaken from his slumber.. I immediately offered him food but declined.. Maybe somebody gave him already.. I tried to befriend this cutie because I immediately fell in love with his eyes! One is blue and the other is amber and he is pure white! 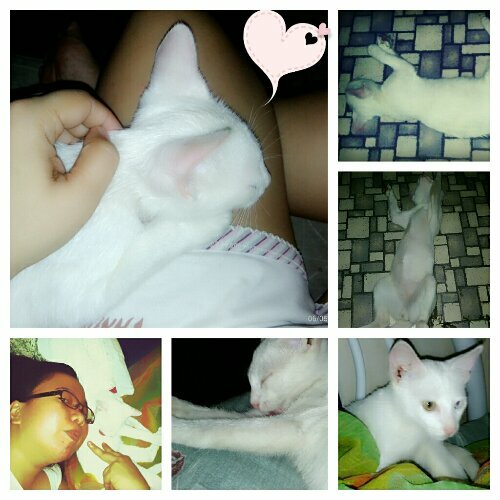 When he finally decided to trust me, I lead him inside our home, cleaned him and played with him.. After that, he didn’t leave anymore.. He is such a cutie and loves to sleep in weird positions.. Hmmm.. Hehehe.. He is so loud and won’t stop until you give hm something to eat then once he’s full, he will just fall asleep on the sofa.. He already owned the 1-seater actually.. Hehehe.. Well, again.. Cats are normally like that!! You don’t own them, they own you! !